The LG Nexus 5 D820 manual is available for download. 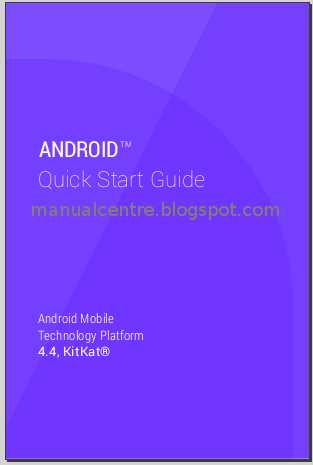 Actually this user guide also known as the ANDROID Quick Start Guide 4.4, KitKat, so no special for LG Nexus 5 D820. It comes in pdf format with file size of 1.45 MB. The LG Nexus 5 runs on Android 4.4 Platform (KitKat). It has 4.95 inches True HD IPS+ capacitive touchscreen with a resolution of 1080 x 1920 pixel and Corning Gorilla Glass 3 protection. There is 16 GB internal memory and 2 GB of RAM. This smartphone equipped with 8 megapixel rear facing camera with autofocus and LED flash. In addition also equipped with 1.3 megapixel front facing camera. The LG Nexus 5 D820 sprint is powered by 2.26 GHz Quad-Core Processor with Qualcomm Snapdragon 800 MSM8974 Chipset. It's work on under CDMA, GSM, and LTE network. The LG Nexus 5 D820 user manual consist of 53 pages. There is two type manual of this phone such as ANDROID Quick Start Guide 4.4, KitKat and Activation and RESOURCES Nexus 5 Sprint. Some imortant information of this manual such as About Android 4.4, Set up your device, lock screen, printing, Android Device Manager, using gooogle play, settings and more.